A friend recently recommended to me the film Agora (2009). I had a hard time getting into it at first, but I am glad I persevered to the end. 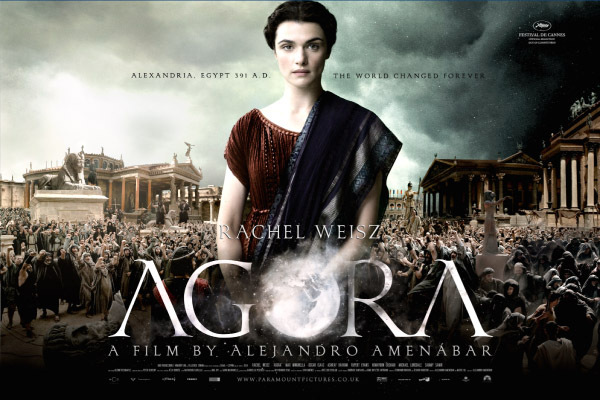 Set in Alexandria, Egypt in the fourth century, it tells the true story of female philosopher and mathematician Hypatia (played by Rachel Weisz). Hypatia had the misfortune to live in a world in which Christianity was quickly becoming the dominant religion due to Emperor Constantine’s conversion. Egypt was a Roman province at the time and Alexandria was a gem in Rome’s crown. Philosophy, schools of thought, astronomy, polytheism, and paganism were widespread in the important maritime port of Alexandria until Constantine issued some edicts that quickly brought about some changes. I had never heard of Hypatia, which is not surprising considering much of my education was based upon first century Christianity and important men of the past. I was surprised to learn this woman actually lived, but it only reaffirms what I have been learning about the surprisingly equal treatment women received within pagan many communities. The first thing I noticed in the film was that many of the early converts to Christianity were slaves and peasants. They despised higher learning and had no problem condemning all who thought differently from them. It reminded me of the modern tendency for conversion among the lower socio-economic classes. I noticed it as one of Jehovah’s Witnesses. Many of the people who would study and convert were typically people whose lifestyle wasn’t ideal. In fact the JW’s would call the preaching work a search for those “who are sighing and groaning over all the detestable things” (Ezekial 9:4). Who but the uneducated and impoverished would look for answers outside themselves and cheerfully anticipate the demise of everyone “better-off”? I was floored. I felt like the movie was written for Jehovah’s Witnesses, but I realize that all Christianity at the time believed counter-points a sin. That’s why Galileo was forced to recant his findings that the earth revolved around the sun and people were burned at the stake for even reading the Bible. When I was a JW, I developed a healthy hatred of Christianity—or I should say ‘Christendom’ because that is how JW’s differentiate themselves from the rest of the rabble. I hated the arrogance and the narrow-mindedness, the judgment and the willingness to kill, or rejoice in misfortune; all in the name of god (I do not capitalize that word intentionally). It sickens me to realize that I was a part of a faith that still practiced the kind of religion that brought about the Dark Ages. Wow! That sounds familiar. So, in the early days of Christianity when they were killing and torturing all dissenters, they practiced shunning—just like Jehovah’s Witnesses do today—robbing people of their freedom to live their life as they choose just as Hyspatia simply wanted to be left to her philosophy and astronomy. Where would our world be if Christianity had never been allowed to take power? Carl Sagan once wrote that, if not for the descent of the religious dark ages that crushed rational inquiry and stifled human progress, we might have reached the stars hundreds of years ago. We have lost so much thanks to religion in general, and women are still fighting for equal rights thousands of years later. This Christian nation still feels it is their right to govern a woman’s choices regarding her own body. I firmly believe our race and culture will not evolve to the next stage until it realizes the stupidity inherent in religion. Until we rid ourselves of the thinking that still resides in the dark ages. As individuals, we should long for the peace and prosperity of the human race and withdraw from systems of beliefs that only anticipate mass destruction!